When someone wants to move from the coffee industry into the espresso industry, there is one shocking realization everyone has: espresso machines are expensive! Espresso machines can range from as cheap as $500 and $10,000 and, in rare cases, more! It can be presumed that the target range between what is considered cheap and what is considered quality is around $1000. With that being said, if you are in the market for a new espresso machine, there are ample espresso makers that are profoundly amazing under $1000. While the intention of each machine is to make espresso, there is a grave difference in the variation of prices. Many people are often unaware of the different systems, pumps, and input/output complexions. This is aside from the importance of a high quality and caliber espresso grinder, which costs between $500-$1000. In other words, every single espresso machine is entirely different! For an example, in machines that are above the $1000 target market, they are often able to produce higher and consistent levels of stability in temperature. In others, there are double boilers which allow for the production of espresso and steamed milk simultaneously. What many people often wonder is what they could expect from an espresso machine under $1000. Truthfully, if one is well aware of their options, there are numerous benefits! For one, there are many espresso makers that come built in with a bean-grinder, which is essential. With perfect measurements, machines are able to perfectly calculate a double or single-shot. On top of this, the best machines will include some form of a heating system, which allows for the greatest level of accuracy for your desired temperature. You can also expect to steam milk and to create froth for the most delicious cappuccinos and lattes. The major difference between this category of espresso makers and the most expensive is truly the advancements in the portafilters, the design, brand and the luxuries of grinding, frothing and mixing different shots. As you reach the $1000+ category, these machines can be considered more industrial. Those under $1000 are perfect for at-home use. Manual espresso machines are different than many of the machines that people see in the stores. These are the only machines that give the user full control over the entire brewing process. A manual espresso maker functions off pressure. The pressure will trigger enough power to stimulate the entire extraction process. This is different than that of a pump-based machine. The entire process is this time is dictated by what you desire. Once the shot of espresso begins, you are required to stop the machine upon completion. Each shot here will take 20-30 seconds. As the title suggests, with programmable doses, the user has full control over the time of extraction through programming it. An automatic espresso machine is quite similar to that of a semi-automatic espresso machine. The major different is that an automatic machine contains a microprocessor. These are utilized for programming the perfect espresso drink. At the same time, instead of a one-button machine, an automatic machine will come with numerous options depending on sizes and grade of espresso. Out of all of the espresso machines in the industry, these are the kings of the industry. These machines possess the full capacity and features to do it all. One of the most notable features of a super automatic espresso machine is the built-in coffee grinder. Aside from putting the beans inside the machine, the entire machine does all of the work! All the user is required to do is program the machine and clean it. These are often the machines that coffee shops and restaurants utilized for customers. Today, numerous companies have produced perfect super automatic espresso makers for the home. 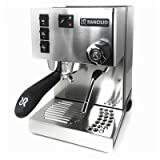 For those seeking a high quality and powerful espresso maker under a $1000, this is unanimously a choice among espresso lovers. The machine is relatively similar and comparable to others in the market as it only 23 pounds and 13.2”x 12.5” x 15.8”. This is important because this machine fits perfect on any kitchen counter. Fully equipped with an integrated conical burr grinder made of stainless-steel and a ½ lbs hopper for bean storage, the flavor from each individual espresso is treated like royalty. 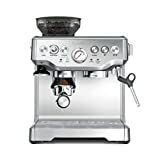 With adjustable grind settings, this espresso maker properly calculates the amount of espresso grind required per shot, providing you with the perfect shot, or double-shot, of espresso. 54mm Stainless-Steel Portafilter that comes wihth commercial style spouts. Thermocoil heating system to properly and accurately measure and gauge the temperature levels. With the Breville Barista Espresso Coffee Maker, you will never need to transfer the ground espresso anymore. It will be directly deposited into the filter. This is the hands-free feature. Easy and light to clean! With removal drip trays and a cleaning-kit, this machine is ready to be taken care of. Produces rich, strong and flavorful espresso. Easy to clean and maintain, has a stainless steel aluminum casing. Does not meet commercial use standards. It has always been said that Italians understood the art of espresso. This fact is proven true as the De’Longhi is one of the most famous espresso makers in the industry hailing from? Italy! Weighing in to the competition at 28 lbs and 15” x 11” x 14” inches, this is pristine and aesthetic piece of beauty just waiting to be placed on your counter. In comparison to many of the other machines in this market, the De’Longhi has been build to last from the highest quality of materials and the most luxurious features. Many people don’t realize that espresso maintains a stronger aroma and flavor if brewed instantly. The De’Longhi has a built in bean-to-brew system to minimize the delay and effort the grind the beans and brew a shot of espresso. With a quiet burr grinder, this guarantees an intense aroma and flavorful shot. The quiet burr grinder also comes with the option to decide the level of fineness. This espresso maker comes build with two stainless-steel boilers, which accurately distribute the temperature. If you happen to miss pulling the shot, this maker also comes with an instant-reheat function! Your espresso with this machine will always be at an optimal level of temperature. This machine also comes built De’Longhi’s “Cappuccino System”. This system is designed to mix together steam and milk to create the richest froth known to the industry. This system is user-friendly and only requires a push of a button on the high-quality control panel. The De’Longhi Espresso Machine comes with the unique feature of a removable water tank and bean container, both which can be removed without moving the entire machine. The machine allows for all different sizes of espresso with different spigot heights. A high quality front control panel which allows for the user to customize their espresso to their desires. Some many prefer the espresso a tad stronger than others – this machine can do it all! Note: Is price not a limiting factor? Then check out our selections of the best espresso machines, period. The brand Rancilio is often known by numerous commercial coffee-shops and restaurants around the world. To bring that experience to the household, Rancilio developed the Rancilio HSD-Silvia Espresso Machine. This high-caliber and cost-effective espresso machine weighs 34 pounds and measures precisely to be 9.2” x 11.4” x 13.3”, which is perfect for the espresso-lovers at home. Built from iron and stainless steel, this is a beast of a machine that is built-to-last. Its stylish and sleek looks are just the beginning of its list of features. One feature that sets this machine aside from others is Rancilio’s commercial grade grouphead. This guarantees the user has a temperature controlled and accurate shot of espresso. The Rancilio HSD Silvia comes built with a 58 mm ergonomic portafilter. This is another impressive feature that assists in the entire extraction process. This feature also guarantees the richest shot of espresso. In this bracket, this machine possess the largest volume capacity of a single boiler. For those who often host parties or have friends over for an espresso, this machine is perfect for rapid shots. With an impressive fast recovery time, the Rancilio was built for entertainment. Another impressive feature of this espresso machine is the articulating stainless-steel steamer. Equipped with professional-grade steaming knobs, the user is guaranteed the perfect steamed milk. The art of precision was the focus of attention when building this powerhouse. Each shot is full of the rich aroma of espresso and a blast of flavor. When it comes to beauty, there is no other machine that can compete with the Saeco InteliaDeluxe Espresso Machine. This is one of the most user-friendly espresso machines in the industry with an LED display and electronic controls for customization options to create the best and tastiest espresso. This machine weighs just about 20 pounds and measures 10” x 14” x 17” inches, which is perfect to fit under cabinets and/or between other appliances in the kitchen. This is simply the beginning of this machine’s impressive list of features. This machine comes built with a massive 50-ounce water tank that is compatible with Intenza filters. Whether than find a place to put your espresso or beans, this machine comes with a 10-ounce bean hopper to protect and harness the price possession. The Saeco Deluxe comes with a ceramic grinder that is high-tech and perfect to grind and minimize intense heat during the process. Cleaning has never been easier with this machine! It comes with an easy removable brew group so the user can easily clean and maintain their machine. If you happen to be a fan of frothed milk, this machine comes with an automatic milk steaming option/attachment. There is also the opportunity to manually do the work if you prefer to do so. Customize your espresso with over five different options of grind strength. You also have the opportunity to choose from 10 different fineness settings as well. These options allow for you to truly make the perfect shot of espresso. In the energy-efficient world today, this machine can be put into stand-by mode, which will automatically save energy! With this machine, you are investing in the planet and mother nature. This machine is known to produce the richest aroma of espresso and the best tasting shots of espresso. In the espresso world, there are numerous machines that are utterly complex and can be frustrating to use. Lavazza has built a machine that matches the quality of taste and aroma with its competition but in a much more simplistic mannerism. 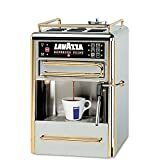 The machine is only 25 pounds and measures to be 15” x 15” x 12” inches, in other words, this is a smaller machine perfect for the average at-home espresso maker. What is better than a compact and portable espresso machine? The Lavazza Espresso Point Machine is bringing simplicity to the espresso world with a mess-free process. The Point utilizes a unique system that runs off of easy-to-use espresso pre-packaged cartridges. Simply place a pre-packaged cartridge into the machine and the machine does the rest. This machine may produced high-quality espresso, hot-chocolate and soup. The machine also comes with a manual option for those who wish to brew a fresh cup themselves. Simplicity is at the forefront of this machine. With extremely simple control buttons, this machine is straightforward for every user. A major benefit of this machine is its Steam Wand. The Point comes built with a steam wand to steam the perfect milk and froth. Made from entirely stainless-steel, this machine is wand are easy to clean.